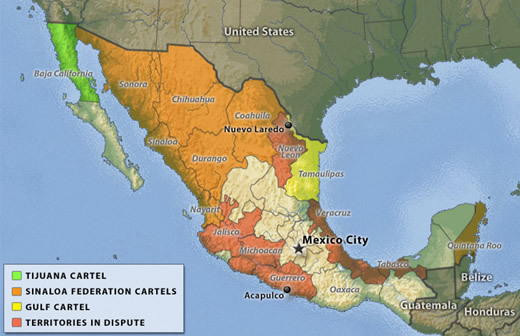 Interestingly, Mexico has lately been compared to Pakistan as a country “on the verge” of becoming a “failed state,” with the Mexican drug cartels accused of playing the same “destabilizing” role as the Taliban/terrorists in Pakistan. Calling such a comparison a stretch would be a gross understatement, of course. There is in fact a real connection between Mexico and Pakistan that’s worth discussing, though you’d never hear it mentioned in the mainstream media. Both countries have governments that are virtual pawns of the U.S. and, as such, are having a difficult time with their native populations as they attempt to please their real bosses — U.S. mega-corporations and rich investors. And these bosses can be demanding. For example, in Pakistan the U.S. dominated International Monetary Fund (IMF) is demanding that Pakistan privatize state-owned banks, railways, power plants, water, insurance, factories, etc. — so that U.S. corporations and investors can buy them at discount rates for private profit. In Mexico, the same U.S. groups are lustfully eyeing Mexico’s number one source of national revenue: the state oil company (PEMEX). Mexican companies and natural resources had already been gobbled-up by U.S. corporate vultures long before NAFTA came into effect, though this trade agreement intensified the trend, making it a good place to begin if one is to have any understanding of the current political situation in Mexico. NAFTA is in fact more than a trade agreement, it’s a trade bloc, the size of which rivals the European Union as the world’s largest. A trade bloc is essentially an agreement between countries on economic integration, which inevitably includes varying levels of political and military agreements. Also, every trade bloc has a dominant member — which in NAFTA’s case is the U.S. When NAFTA was enacted, a new flood of U.S. corporate and private investment flooded into Mexico, requiring that this money be well protected. For the international investor, political instability of any kind is bad for business. This is in fact why NAFTA was extended into the “Security and Prosperity Agreement,” which provides U.S. security (military) aid to protect the NAFTA-created prosperity (investments) inside of Mexico. “We act as a potent deterrent against [foreign] government actions that may adversely affect investments. And even if disputes do arise, our leverage with host governments frequently enables us to resolve differences to the mutual satisfaction of all parties.” Such security is ultimately guaranteed by the U.S. military. 1) Commodities coming in from the U.S. because of NAFTA promised to out-compete and destroy Mexican farmers and businesses. 2) Mexico is highly dependent on high oil prices that have since plummeted. 4) Mexican exports to the U.S. – 80% of its total exports — have sharply declined because of U.S. workers’ inability to consume them. 5) Remittances from Mexicans living in the U.S. have dropped sharply due to the recession. This economic situation promised that the Mexican working class would be pushed into desperation, and that police-state measures would be needed to control them, since they might demand that U.S. owned corporations in Mexico should instead be used for ordinary Mexicans. Those who didn’t emigrate to escape the crumbling economy would likely rise up. The first uprising in Mexico began like clockwork, on the day NAFTA was enacted in 1994, led by the Zapatista movement. The Zapatistas were protesting the inevitable effects NAFTA would have on Mexico, though especially the widening of economic inequalities, privatization, and the negative impacts of “free trade” with the more powerful U.S. economy. U.S. investors demanded that the movement be crushed, and the crushing is still going on today, including a horrific list of human rights abuses by the Mexican military and federal police — the same people that the U.S. media is daily praising. Laura Carlsen, director of the Mexico City-based Americas Policy Program of the Center for International Policy, writes how the Mexican army has recently used its “war on drugs” as an excuse to repress the Zapatista movement, among others. The current President of Mexico, Felipe Calderon, first announced the “war on drugs” in circumstances that led many to question his motives. For example, millions of people in Mexico rightly believe that Calderon stole the 2006 election. The resulting mass protests destabilized his incoming government, forcing him to be sworn in under conditions of secrecy. At the same time, an extraordinary uprising in the state of Oaxaca led to a people’s government headed by a democratically elected Popular Assembly (APPO). To ensure the incoming president a somewhat stable beginning — as well as assuring corporate investments in Oaxaca remained untouched — exiting President Vincente Fox turned to the Mexican Federal Police to crush the movement, using the proven tactics of paramilitary squads; “disappearances,” assassinations, illegal detentions, etc. (between 2007 and 2008, 1,602 such incidents of human rights violations were officially reported to the government’s National Commission on Human Rights). And intervene they have. This war has sent tens of thousands of Mexican army and federal police into the streets of Mexico, and violations of human rights have exploded in the process. In “Operation Chihuahua,” a major campaign in the “drug war,” the Mexican army rounded up political activists and opposition leaders who had previously led protests against NAFTA. Another extreme violation of human rights occurred in the Mexican region of Atenco, where activists were targeted and tortured, and a whole community was terrorized by the Mexican federal police to crush opposition to government policy. The logic is disturbing: “extraordinary measures” are supposedly needed to battle the Mexican “narco-terrorists.” These measures include not only the above-mentioned human rights violations, but the virtual destruction of basic constitutional rights. An apt comparison can be made to the U.S. government’s equally-ridiculous “war on terror,” which has also led to human and constitutional rights’ violations, while being based on similar motives. In 2008 the ante was upped in Mexico. The Merida Initiative was passed in the US congress — also known as Plan Mexico (based on the similar “plan” in Colombia). This agreement adds billions of dollars in U.S. military aide to Mexico, including “counter-narcotics, counter-terrorism, and border security.” Plan Mexico is in fact a mere extension of NAFTA’s “security and prosperity” agreement, but with a more blatant role for the U.S. military. Similar scare tactics were used to achieve public support for Plan Colombia, where billions of dollars of U.S. “aide” have helped militarize the country in the fight against “narco terrorists.” The results aren’t surprising: Colombia’s human rights record is the worst in the hemisphere while being the number one cocaine exporter in the world. Colombia is a much-needed pawn of U.S. foreign policy in a region that despises past U.S. military and economic intervention. It should be noted that the only two openly right-wing governments in the region are Mexico and Colombia. Ultimately, the accusation that a country has “failed” has been used as a pretext for U.S. military involvement. This is indeed the case for both Mexico and Pakistan, where corporations and investors work in tandem with puppet governments against the wishes of the population. The possibility that such police state measures can be transferred to the United States is very real, especially because of the Bush-era destruction of civil liberties that Obama is unwilling to reconstruct, let alone talk about. If policies are not put into place that immediately help the newly-created millions of unemployed, un-insured, and recently homeless, social unrest will undoubtedly emerge, and the measures Bush created will be further used against the U.S. working class. In this case, the police and military may be used to “maintain order,” possibly under the guise of a “war on terror” or “war on drugs,” or another creative campaign.